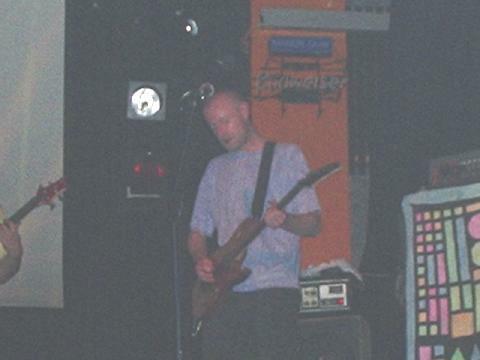 Mr Quimby's Beard - history goes back at least 10 years - first live performance 1993 in the Sunderland area with Afresco Mantis - supported Hawkwind on tour and performed at Hawkfests 2002 and 2003. Hmm - 10 years of history, I mused, as well as Hawkwind links - this definitely needed further research. I boarded the train south - it was on time - more remarkably it was empty. Nothing suspicious here but I made a note that clearly the English taking a holiday and digging up the railways lines significantly improved the entire rail network as far as Scotland was concerned. The day was bright - the scenery superb - the journey swift and trouble free - within 2 hours or so I was outside my overnight accommodation - stunned. The coastal strip north of Sunderland was a fantastic clean extensive sandy beach framed by limestone cliffs - a calm sea - a hot sun bright day and it was almost deserted. Definitely something to be noted. Quick dinner, then a walk down to the venue tucked carefully out of sight off the main road - thanks to the directions I had there was no chance of missing it - which was worth noting down - as was the fact that the venue was severely short of audience although the band playing was extremely good - elegant flute playing with solid rock guitar backing. 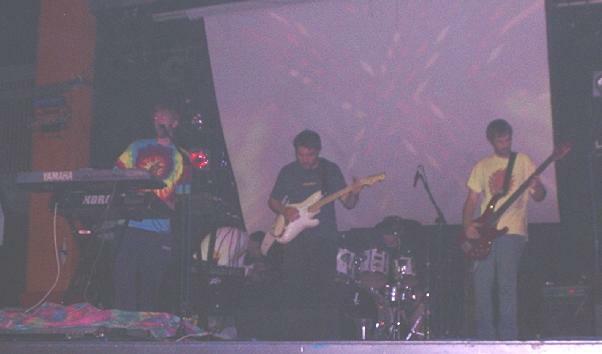 I made a note of their name: Afresco Mantis - the band who had played with Quimby back in 1993 - and collected some evidence in the form of a CD, "The Harris Tweed EP" - another Scottish connection I noted. On my return I swiftly played back the CD. Exactly what I suspected - a good, tight, powerful flowing sound - an excellent and professional band far too good to be unknown - this was vital information that needed to be passed on immediately. Back at the venue I was greeted by name as soon as I arrived not only by Marie (she and Neil were doing the lights) but by Hardy of Mr Quimby - damn - my cover had been blown before I was even through the front door, no chance of remaining anonymous here! And no time for long conversations - I was too busy collecting evidence in the form of CDs and even clothing with a Harvey Bainbridge t-shirt and then Marie had to go off and do the lighting for Harvey's show. A typical Harvey Bainbridge style set - no concessions here I noted - a dark stage - a voice from the darkness - flowing, flickering lights on a backstage screen - starting with Coded Languages, through ambient tracks with an intensity, sometimes strident, of synthesiser sounds. The set culminated with Mr Quimby's Beard joining him on-stage in a stunning performance of Freefall with the base jumping videos as a backdrop - powerful stuff. Then Mr Quimby's Beard took centre stage and, well, all attempts at objective note-taking became thoroughly subjective impressions. Somewhere I was (I suspect) Shrouded in Mystery, lost in Darkness, Mystery, Travelling through Nebulae edged around with a Marijuana Nightmare, and carried in Chariots to Beyond the Light. Gentle keyboard and synth intros evolving into structured soundscapes with rhythmic melodic themes - some fast and very heavy - some with half recognised Hawkwind or Ozrics styles developing into melodies completely independent and unique - drifting from peace to paranoia and back again - keyboards flowing into guitars - swooping synths - a patient, steady drumbeat to add depth - and vocals, (in honesty, more Harvey Bainbridge style denounced than sung but always adding atmosphere) with some truly glorious flowing lyrical instrumental themes (Chariots perhaps?) and Beyond the Light. And behind it all - the lightshow. Colour-burst visuals, swirling spiked lights, rotating webs, some wonderful astronomical intergalactic images for Nebulae (I assume!) with exploding supernovas in Mysteries. Then in a culminating track to close the set Harvey Bainbridge came on stage to join them for an incredibly powerful Utopia while images of a busy metropolis were followed by a kalaidescopic blizzard of colours as everything went ballistic. Finally a small, stunned and utterly happy audience were treated to a calm instrumental track with swirling starscapes and fractal coils to finish off. So I left, passing on my way out two guys who were coming back in again - "we left but we didn't say thank you" they explained to the security man as they went back into the hall and I have rarely seen a more incredulous look on someone's face than on the countenance of that man as he stared after them. How to explain this back in Edinburgh? I wondered as I walked back along the cliff path and I knew it would be criminal not to evaluate this evidence more carefully. So on reaching the guest house I kept walking - in the dark, under a starlit sky, accompanied by the sound of waves surging onto the beach on an incoming tide - following the sea sound up to a majestic stone monument to Bede - this man who by himself preserved the History of Britain - people, events, lives known only because he recorded them. Perhaps there was a lesson to be noted there, I mused. So thank you to Mr Quimby's Beard, Harvey Bainbridge, Afresco Mantis and everyone else who took part. This is the written record - a poor one I'm afraid, but there it is. And anyone who wants to hear the recorded sound - for goodness sake get hold of one of the albums - you really won't regret it!